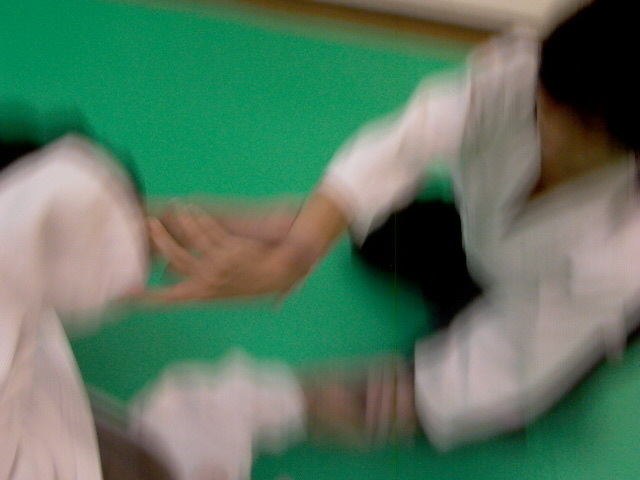 The power used in Aikido is referred to as kokyū ryoku. This force accumulated in the seika tanden fills every part of the body, like water flowing out that never stops. This force extends from a calm, serene and relaxed body and mind and can be used whenever necessary in any direction. This force is called kokyū ryoku. An aikido technique done without kokyū ryoku is not an aikido technique. It's like champagne without sparkle or flat beer. Here we are on a site called AikiWeb. The site for information and discussion about aikido. Aiki plus web. Aiki. What is it, this aiki? It's a word with an elusive meaning. If it is a word. Japanese people would not know it. It's not in Japanese dictionaries except as a component of aikido or aikijutsu or aikijujutsu. I checked a thirteen volume dictionary of nearly twenty thousand pages and it is not listed. I have lived in Japan and done aikido for many years and I have almost never heard anyone say aiki. I have very occasionally heard aiki used as shorthand for aikido or Daito Ryu or aiki arts in general. I have never heard the word aiki used in aikido to mean internal power. So who uses the term aiki to mean internal power? Not O Sensei Morihei Ueshiba, the founder of aikido. This is a doka - an instructive poem - by O Sensei. The translation is by John Stevens from The Essence of Aikido. By the way this is an excellent translation. It correctly catches the meaning. It is clear and understandable. And it can stand on its own as a doka in English. O Sensei used aiki in this universal sense here so it is hardly conceivable that he used it in a different sense in his other writings. So when I read the word aiki by O Sensei I take it to mean aikido. If we break the word into its component parts it gets even more unlikely that it can mean internal power. Ai 合 あい means meet or fit or join. Awase and awaseru - blending or uniting - are written with the same Japanese character. Ki 気 きmeans energy or spirit or life force or intention. So aiki can mean joining of energy or spirit. Or energy or spirit becoming one. That's the real meaning of aiki. It's not what people who don't do aikido want it to mean. It is not possible to construe a meaning of internal power from these kanji. Finally I want to get back to internal power, the real power of all martial arts. In aikido the effortless power developed by great budoka is called kokyū ryoku. Breath power. That is what O Sensei called it. I know because that's what he called it when he told my first aikido teacher Kinjo Asoh Sensei (7 dan) that he had to get kokyū ryoku by all means. And kokyū ryoku are the words my second teacher Sadateru Arikawa Sensei (9 dan) used when he talked about internal power. Kokyū ryoku is what Sunadomari Sensei (9 dan, founder of Manseikan Aikido) and Tamura Sensei (8 dan) called it. And kokyū ryoku is what I call it too. "In this thing called Aiki, first describe (draw) a circle. Drawing a circle is, in other words, opposing powers. With touching with even one finger your opponent will be sent flying." I am working on a project of my own exploring what he actually said and the relation of what he said to well established internal training in Daito ryu Koryu, India and China. Ueshiba's continuos discussion of in yo; both explicitly and metaphorically, and his use of identical and previously documented language define him as an internal strength advocate. He directly quotes from Chinese sources. Any attempts to make his power unique and original will end up like the myth making undertaken by the aikikai, it will ultimately fail. The things he quoted are too well known and easily recognized by educated budo-ka. Trying to argue them away or make them go away or redefine it so people in the art can say what ever they want it to mean will simply not survive diligent scrutiny. While I understand the tendency to vet opinions and views through rank and affiliation, I remain unmoved, figuratively and literally, by how long someone has been in an art as any indicator of his skill and real understanding. There is no consistency I have found to lend that argument credibility. Shodan to 9th dan- your understanding is in your own hand, not in where you went or who you know. While I remain mindful that aikido is more than internal strength and aiki, I am also aware that without internal strength and aiki and what that entails, people are simply not doing Aikido, the way of aiki. They are doing jujutsu. Which apparently was O sensei's view as well. He was clear in stating that people cannot do what he does because they do not understand in yo, he has in many places defined his understanding of in yo ho it was the union of opposites.... in yourself. Aiki in me/ before aiki between thee and me. When it comes to what or how often O'Sensei said this or that I find there is only one continuous theme: Universal. There is universal love, there is the spirit of loving protection, there is Ki (once again universal) There is God and spirit. All to do with Aiki, Aikido,universal. Then we have people, used only to being an individual, separate, body and mind. Oblivious to the workings of the aiki of the universe or any connection to it. Thus it is the universal principles that can be felt in the body. Thus the joke is it is the true external, universal that is the true source and the internal is the effect. When harmonized with then internal and external become one in harmony. What about internal power makes it not universal? When I read that doka, I see an example of him discussing what aiki is, ultimately. It does not touch on the process of getting it though. kokyu ryoku isn't aiki, but IMO it's certainly one of the things you would need to create aiki and based on your quotes it seems like he stressed that to his students. Almost as if saying doing these techniques with kokyu ryoku is what makes aiki. I recall hearing this somewhere else before too.... no kokyu, no aikido. So if aiki needs kokyu ryoku, as your post suggests, how do you create kokyu ryoku if not internal? You cut nicely all this mumba bumba aiki gibberish. But neither is breath power all there is to internal...or aiki....as you also know. Hmmm... with all the interest/ angst being displayed over this topic you would think at this juncture there would be a more detached and analytical review of both the material and the deliverable skills that are being displayed world over that continue to leave the detractors standing there with blank looks on their faces. a. They don't know what Ueshiba was talking about in regards to in yo ho, internal training, and aiki.They've never even heard of many of the terms or concepts before. b. They don't know the terms are ages old, documented and were known and used to produce power in warriors who trained them. c. They can't display any serious amount of power themselves or an ability to explain how to go about it consistent with Ueshiba's own commentary and quotations. Were there to be a debate over substance then both parties should at least be capable of bringing a positive understanding of all three; a. b. and c. to the table. Then some semblance of equal level in understanding and discussing these things and demonstrating them with clarity and consistency from translation, to description and definitions, to historical context, to teaching models, and practical use and then demonstrations of some serious deliverable power should ensue. None of the detractors have managed to deliver a consistent message in person. It really hasn't left much to discuss or debate. The differecnes in understanding were clear. So thankfully, it continues to bring people together instead of dividing them-just like he thought it would. And many of the doka you think are his that are quoted.....are internal Chinese martial art sayings! Last edited by DH : 01-17-2012 at 01:09 PM. so what you are saying that these stuffs were Made in China? are there anything that not made in China these days? this morning when i did my self-examination in the shower, my wife asked, "what are you doing?" i said i was doing some internal gigong to increase my fajing and want to make sure nothing Made in China shown up unexpected as i got older. she said she was wondering about the quality of the material. hmmm wonder if "mumbo jumbo" also Made in China. But invented, like everything, in Korea. The issue with aiki and internal power is actually a little more complex, but without getting into that right now - it's entirely conceivable. "Aiki" has a specific technical meaning, one that predates Ueshiba, and one that he was trained in - I would think it even more inconceivable that he'd take that word and slap it as a label on an entirely different concept. On the other hand, it's clear that he's talking about a more expanded definition of "Aiki". Expanded meaning "based upon" rather than "differentiated from". It's pretty clear from things like Take Musu Aiki that he linked his technical training in "Aiki" into a more spiritual definition. But take away the technical process and you break the system - you may have something good, but it won't be the same as what he was doing. If we break the word into its component parts it gets even more unlikely that it can mean internal power. Ai å�ˆ ã�‚ã�„ means meet or fit or join. Awase and awaseru - blending or uniting - are written with the same Japanese character. Ki æ°— ã��means energy or spirit or life force or intention. But are we actually worshiping a Roman god when we practice "martial arts"? It can get tricky when breaking down things into their parts - English idiom, for example, is by definition something that has a different meaning from the sum of its parts. As above, "Aiki" has a meaning which pre-dates Ueshiba, one in which he was trained, and one which he taught - over a span of more than twenty years. Finally I want to get back to internal power, the real power of all martial arts. In aikido the effortless power developed by great budoka is called kokyÅ« ryoku. Breath power. Just to add, when it comes to truth then we are talking universal. Universal truths or principles obviously apply to everything. Aiki thus is about those universal harmonious workings of the universe from the atom and electrons etc to the stars and planets and to mother nature itself. When you become aware of a truth as such you see it in operation both internally and externally, the same truth. You see it in operation in nature, in your own body, in life itself, in the wall in front of you, Aiki. Of course others who have gone before have touched upon or realized these universal truths and even said so and demonstrated as much no doubt. But who can hear? Who listens? Most retranslate it as a selfish thing and thus it gets called from internal to secret power and no doubt lots of labels. Seen in this light we can understand the use of internal being used historically for in the history of warlike peoples those families, groups, clans, or sects found how to use a few principles which made them 'superior' and thus kept it internal and secret. Thus mystifying it. to dominate and control. To handle their own fear. As for kokyu ryoku and breathing? Universally what is this? It's not some secret. Internal folks call this aiki like it's something special and thus miss the beauty of the universe. It's almost back to front calling this aspect aiki and thus a mix up of terminologies. The universal principles of breathing are not to do with air entering the lungs for that is merely an effect of such a principle, one effect only. It is all part and parcel of universal Aiki but of itself is a major principle. It is yin and yang, that's what the whole subject of breathing and breath is all about. The basic principles of inflow and outflow. It's not mysterious internal aiki for it is in operation in every living and non living thing, in every atom and every universe, in every action and every stillness. To clear some more mystery I would say the understanding of such from a self centred view, a misinformed view, a view based on defeating opponents, would be it is about the theory of opposites. Alas, in truth it is not. It is the theory of complimentary opposites. That is the concept to come to terms with and understand. It is breathing and clearing. Taking in and expanding out. Harmony. So when a man demonstrates such things and says he is merely a vessel for the universal and is not trying to defeat or outwit or go against in any way what do others see? They see a man defeating others, superior, with special 'secret' powers he's not teaching. Thus they search for hidden clues. Such a man would see the history and misuse of such principles and remove himself from such aims as it had been previously used for. And thus would come into being a new art that may look similar but is totally different as it is not all about self, it is universal. Breath with your body, breath with your mind, breath with your spirit, breath with your soul and breath with your heart. Thus breathing with Ki takes on a new dimention for it is infinite and universal. Note Shishida Fumiaki's article, "Counter techniques against Judo: the process of forming Aikido in 1930s." The expression “Kokyu wo ire” means “show sprit” use in 37 passages in the 147 techniques. Based on examination of these 37 passages, this expression refers to the usage of the hand blade(s) in order to break balance, and it is the same as the skill of aiki, which is, in Daito-ryu, the skill of breaking an opponent’s balance in a flash by straining hand(s). Ueshiba’s martial art emphasizes on throwing techniques. Once we compare his skill in around 1930 with the features of Daito-ryu. (2) Ueshiba’s counter techniques against judo have a unique quality in that Ueshiba always tried to fight before the grasping of body or clothes. (3) Ueshiba was under influence Daito-ryu from his skill “kokyu-wo-ire,” which was almost the same as the skill referred to as aiki in Daito-ryu. At this period, Ueshiba was teaching Daito-ryu. In fact, Takeshita refers to 'Dai-ikkajo, 166 techniques in all." Yet he was already using the term "kokyu." Is it possible that this is merely a change of "brand," concurrent with Ueshiba's first attempts to separate himself from Takeda Sokaku, as described here. To be sure, Ueshiba had his own interpretations, his own nuances - but was he really doing something different from "aiki," in the Daito-ryu sense? 1. That said, I do not agree with the general thrust of Shishida's article, as there is no evidence that Ueshiba ever studied Kito-ryu as a child. This was a mistake on the part of Ueshiba Kisshomaru, that got perpetuated. He actually had a very brief period of study/contact with Tenjin Shinyo-ryu. 2. The term aiki is used in the Toda-ha Buko-ryu mokuroku. 鏁鎌合気之事 Kusarigama Aiki no Koto. The oldest record we have is from approximately 1860, with the 14th generation headmaster's mokuroku. We may have used the term earlier, but there are no remaining records from an earlier period. Hi Ellis, the link you provided to the account of Takeda doesn't seem to work. Sorry - How about THIS? Scroll down for the English. Just send your offer to involved parties, should expect a reply asap. The link does not work in IE, but seems fine in firefox. Hi Niall, I always count on learning something inspirational from you, and respect your knowledge of Japanese language, culture and your years of study of Aikido. I remember Tamura Sensei and Arikawa Sensei were two of Yamada Sensei's favorite senpais. Yamada Sensei rarely spoke of philosophy or concepts, at least in my hearing, and when asked why, he said "I'm not O Sensei" But I definitely heard that he said "kokyu ryoku" many years ago. Kokyu; also referred to as breath power, was discussed by Tokimune, Kodo, and Sagawa; who publicly said he had no use for it (but brought it up anyway) yet privately trained it, Hisa, Okomoto, etc. So Kokyu was in DR, is in DR and is still taught by certain teachers to the present day. He was also discussing many other principles of DR in the 30's as well, I just never considered his discussion of them as a separation to his own art. He was simply discussing what he was taught. I think we have to keep firmly in mind that our discovery of things he may have said here or there as the first time we saw it, has absolutely no relevance as to when he might have said it for the first time. Did he ever do anything different from "aiki" in the Daito ryu sense? I have never seen it. To me the vast majority of discussions on the internet, interviews and in books, revolve around the various external expression of aiki and not what is actually going on. This is largely presented as an observation by those who don't understand what is going on or how it is done. I understand these issues are difficult and seem challenging and an afront to those in the arts. To others they are simply dimissed. Aiki, for them must be defined by rank and time-in. IME, this leads to observations and opinions that are flawed at a foundational level and leads to further confusion. Why? Because many of the seniors opinions on aiki in the aiki arts....are patently worthless. In any event, since we are not assigning validation of opinon by actual ability, we are in a great many areas, reducing this once profound work -once held in the hands of men who were truly capable- down to a working understanding for Budo-ka who upon examination, feel no different than any other average Joe martial artist out there. * Either Takashita and friends and all those judoka were some truly ignorant martial artists to be so impressed by it. * Or there is profound body skills behind the art that impressed people on contact and this fellow had no idea what he was observing and triyng to copy. If he did, the comment would not have been offered. I have read reviews of what was going on -by students of the same teacher- many times senior students. It is often striking to see how they differ. I attribute it more to the understanding -or lack thereof- of the student rather than the teacher teaching different things. Last edited by DH : 01-18-2012 at 09:12 AM. Glad you brought that up--I figured somebody didn't get it and I was hoping it wasn't me. Going back to the 1935 Asahi News video, I could see that maybe "straining hands" was the most visible external indication of what O-Sensei was doing. Somewhat like mistaking the blown leaf for the storm, tho. Ueshiba's martial art emphasizes on throwing techniques. Once we compare his skill in around 1930 with the features of Daito-ryu. This is simply erroneous and once again speaks to the lack of understanding of interviewer and interviewees. You could stop and ask just about anyone well taught in the Kodokai, Roppokai or Takumakai what they are supposed to do before being grabbed and you will get the same answer. They are supposed to already be moving. It is one of many long standing principles in Daito ryu. It is one thing to yak on a board, quite another to meet teachers and students in Daito ryu from all over the world, who do not know or have ever trained with each other- and hear them say the same things to you. So when we read certain observations and opinions about things and Ueshiba doing some stock out of the box (well known in Daito ryu) principles as yet again his unique skill...well...cough...it doesn't go over the same way in different circles. I am sure he had unique skills, even more unique to outside observers who didn't have clue what he was doing, but this-among many other erroneous observations- was just not among them. Peoples rank and closeness to Ueshiba really doesn't quite matter as much as you'd initially believe. While this sounds dramatic or dismissive, all you need due is put your hands on a host of Shihan and 4-6th dans and ask yourselves if all of their opinions on budo are of equal worth either? In my opinion they are not. Last edited by DH : 01-19-2012 at 09:29 AM. Sounds pre Aikido to me. 'When he moves I am already standing behind him' ......Aikido. 'They come, I meet, I turn they follow'..........Aikido. The breath of life ......Kokyu. Hmm, I think that all of those things appeared in Doka written by Ueshiba while he was still issuing Daito-ryu certificates. What is your basis for stating that they are "pre-Aikido". Some things he may have said pre Aikido and as Aikido both. After the Daito Ryu period, after even the Aikibudo period, In The Aikido period.....Ahh, if he says it in this period, whether said before or not, he is talking Aikido. Thus using things said 'earlier' which he never said later is as foolhardy as thinking what you used to believe is relevant to your current view. 'True Budo is love.' An Aikido statement. Anything contradictory or any actions contradictory to that from before in his life are therefore irrelevant. As far as I'm concerned they can only be used by those who try to undermine Aikido, who don't yet fully grasp what Aikido is, or are just neutral, historians. Except for the political stuff (about the emperor, for example), virtually all of the things that Ueshiba said pre-war he also said post-war. Which things, exactly, are you saying are from before and irrelevant? 'True Budo is love.' may be an Aikido statement, but it dates from 1925 - are you saying that everything after 1925 is relevant?